It is very fortunate we are having guests this weekend. 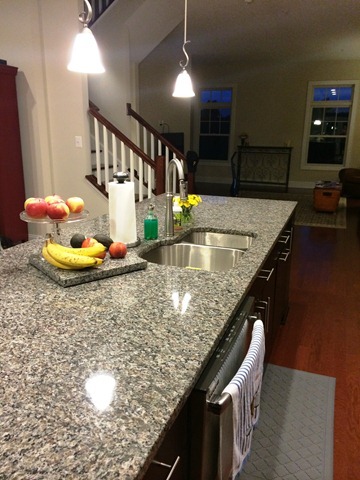 It forces me to clean like a crazy lady…and allows me to take some decent pictures! 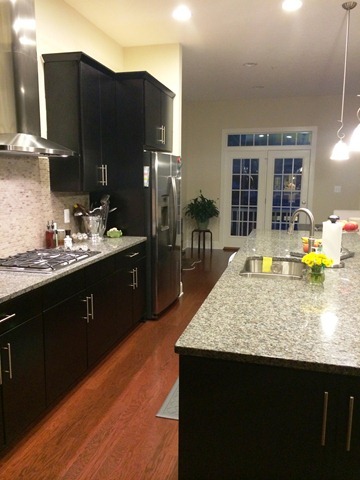 It should be noted, my kitchen never looks this clean. I am so spoiled by this space…I’m ruined forever!! 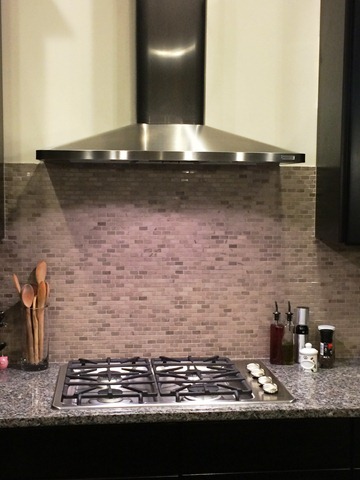 I am in love with this cooktop…and shiny range hood. It’s so easy to clean and cooks like a dream. So come on over! I’ll make you dinner :). This island has been all I’ve hoped it would be. 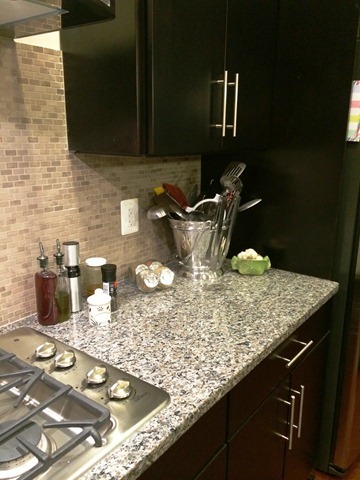 I have tons of prep space and storage in the cabinets. 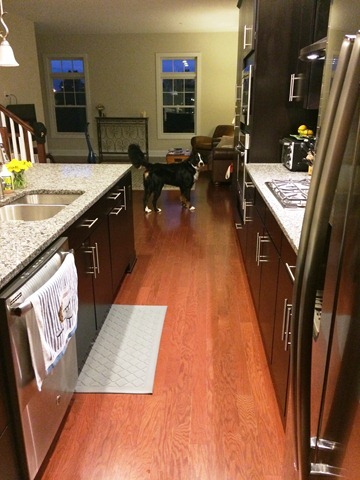 I have a very strict rule about dogs in the kitchen. They’re not allowed. I was nervous this might be an issue with Jacob because it’s so open. But he’s been pretty good. I see lots and lots and LOTS of kitchen time in my future! Happy Labor Day weekend to all of yinz! 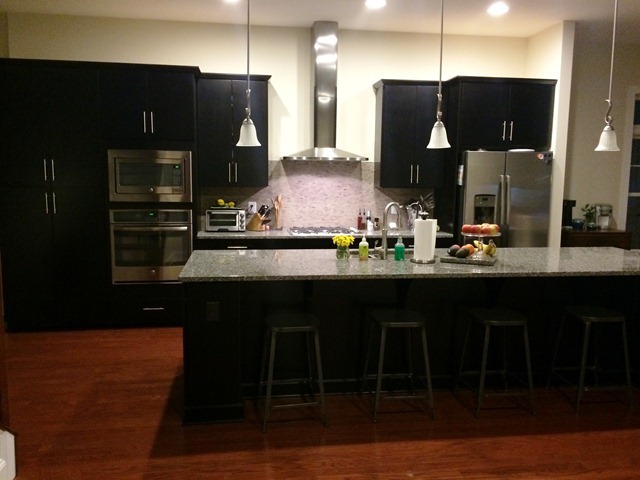 I may have mentioned 926616 a few times, our kitchen was the thing I was most looking forward to in our new place. And I’ve wasted no time getting my hands dirty. In the 10 days we’ve lived here, I’ve been cooking up a storm almost every day. 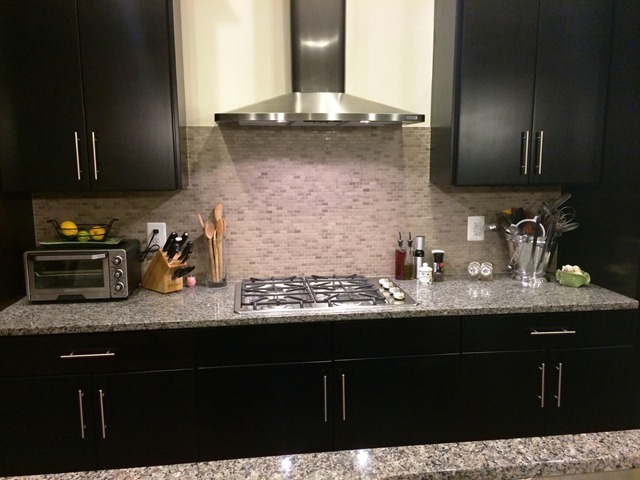 The first, best thing about my kitchen, is the cooktop. 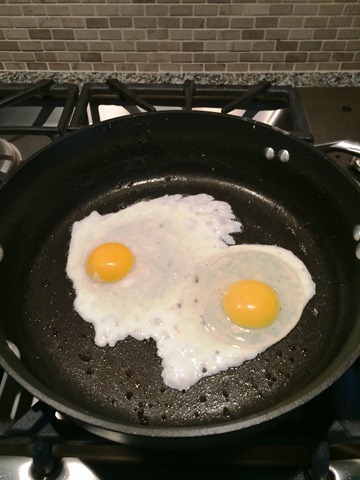 Do you notice anything about the eggs in this picture? They are in the center of the pan. Not swimming along one side because the burners are all lopsided. This shouldn’t been as exciting to me as it is…but I’ve never had so much fun making eggs! 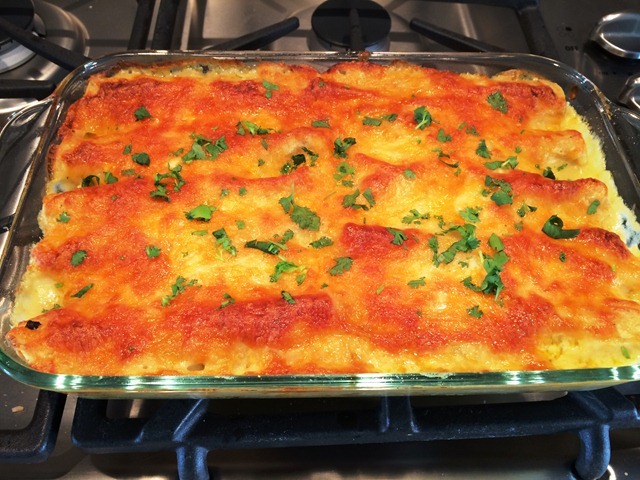 This weekend I made Mel’s chicken enchiladas. They are In. Sane. So good! 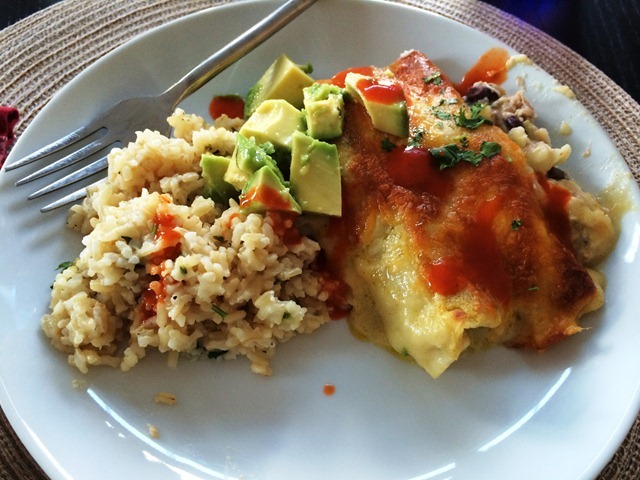 Served with some brown rice and avocado. 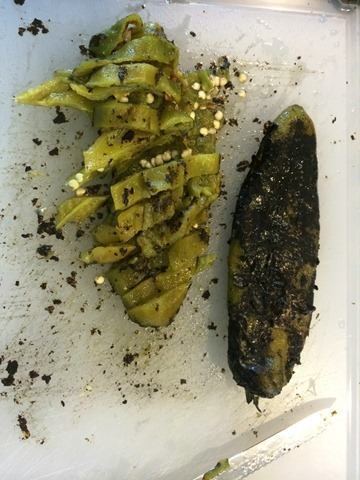 And when I was at the Market District on Sunday, they had freshly roasted hatch chiles available. You bet your bottom dollar I picked some of these babies up! They’re hot. But I like hot. 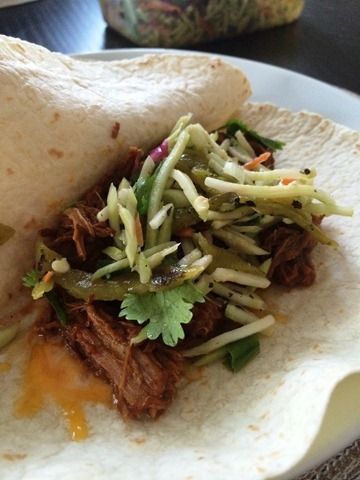 I slow cooked an eye of round roast to make the Mexican Shredded beef from Gimme Some Oven and used the hatch chiles in place of the jalepeno in my simple slaw. Yowza! So about that beef. It’s ridiculous. I’m on a chipotle in adobo kick recently (I know, so 2011) and I want to add that flavor to everything. This recipe is simple perfection. Make it! After our weekend of heavy eats, Jerry and I have pledged to clean up our diet this week. 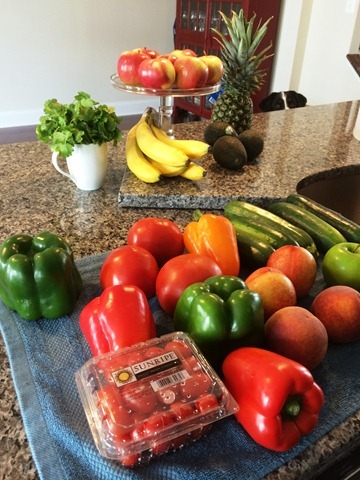 Fresh fruits and veggies make me giddy! And seriously, how cute is my dog??? Where’s Waldo Jacob? We are slowing getting settled into Lot 256. 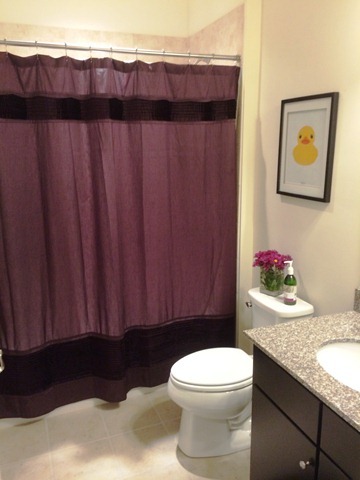 One of the first things I did when we moved in was spiffy up the bathrooms. They are easy. 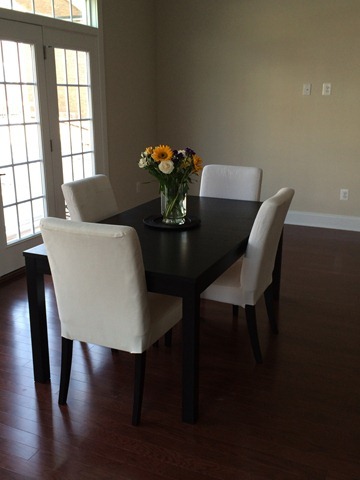 There is no furniture to buy…just toss around a few accessories and that’s that. 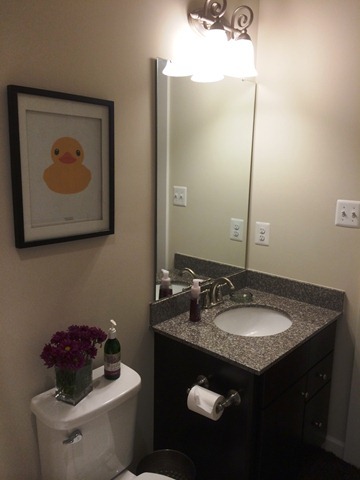 This is a terrible picture of our first floor powder room. Yes, we still have the ugly mirror (although it’s not so bad once there is some stuff in there) and yes, the ugly light fixtures are still there. But they’re going up on Craigslist this week. Those towels are blue, btw. I need to stop using my iphone to take pictures and break out my real camera. I took this picture of the giant duck last summer. It was a perfect day and the sky was an insane shade of blue. My towels match the sky in the picture. This picture was ordered from my instagram account and I just centered it over an old IKEA stock photo to fit in the frame. I like these frames a lot. They were like $15, are pretty heavy and I like the wide mat. Of course when I was taking this picture, I noticed one of Jacob’s hairs stuck under the glass. It will probably be there for a while. Keeping it classy at Lot 256! 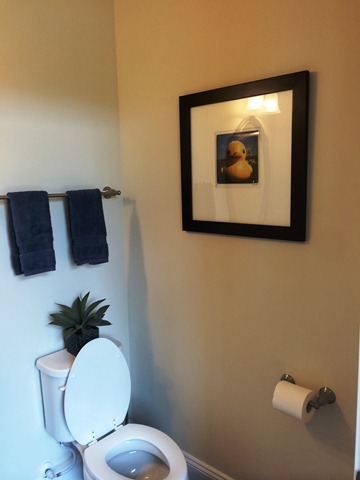 The duck makes another showing in the guest bath. But he probably won’t stay there. We had this print in storage and it got a faint smudge on it during transport. I will probably replace it with something botanical. 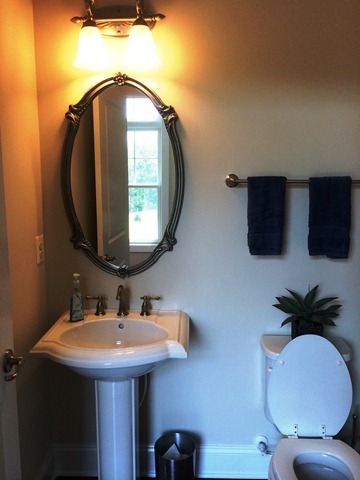 You will notice a bathroom trend at Lot 256. 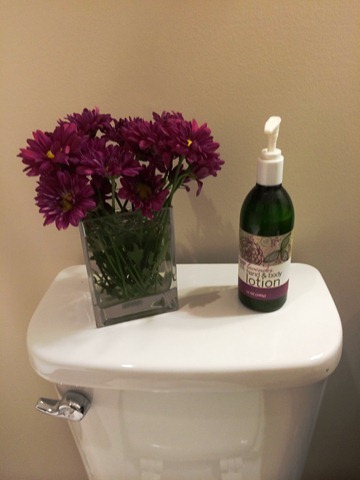 Apparently I have a thing for flowers/plants on the back of the toilet. It’s a hot design tip. Here I have some fresh flowers going on but never fear! I have a fake hydrangea to take it’s place once they die. 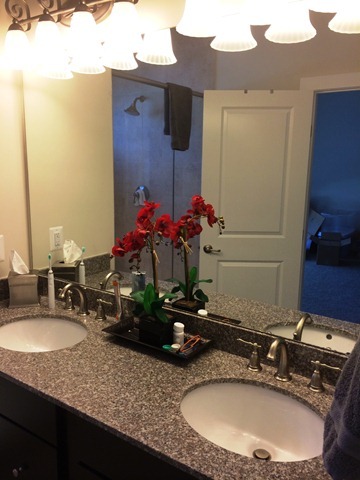 This is our master bath. Kinda basic but I added some color with another fake plant. I’m so fancy. 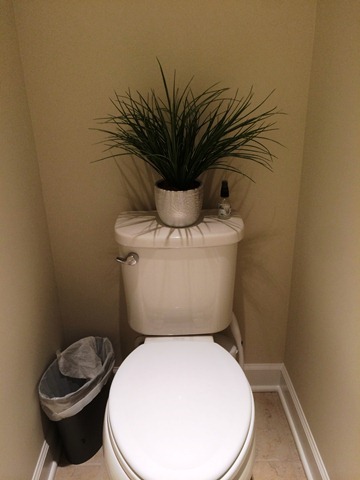 More plants on the master toilet! This little room is so tight…I only use this bathroom in the middle of the night. But the shower makes up for it! 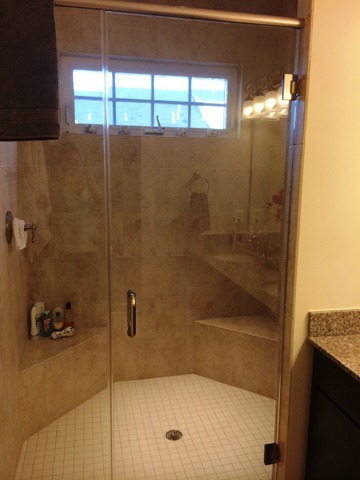 SOO glad we decided to go with the obnoxiously huge shower instead of the small shower/big jet tub option. So that’s your first glimpse at the progress we’re making. More updates to follow as we get other rooms put together. I know. I have a lot of catching up to do. 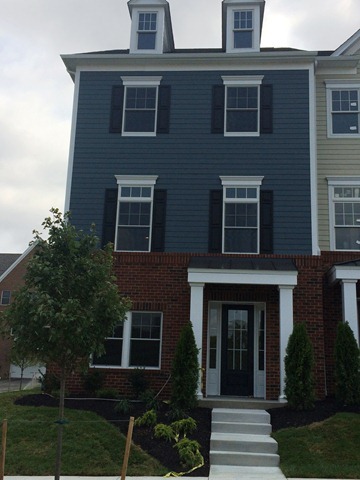 Packing, unpacking, cleaning the old apartment, organizing…we’ve been super busy at Lot 256. 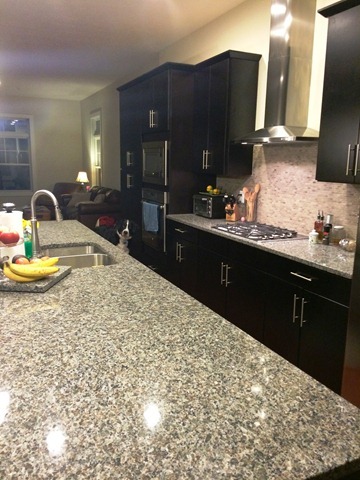 I promise so pics of how the place is shaping up. But here are a few of my favorites from the new house thus far. I found these babies on Craigslist. The set is from Ikea and was already assembled (score!). The price was right, the table length was right and the (omgWHITE) chairs were right (the covers are washable)…so we picked it up as a nice in-between compromise until Jerry builds his table. Now the pressure is off of him! 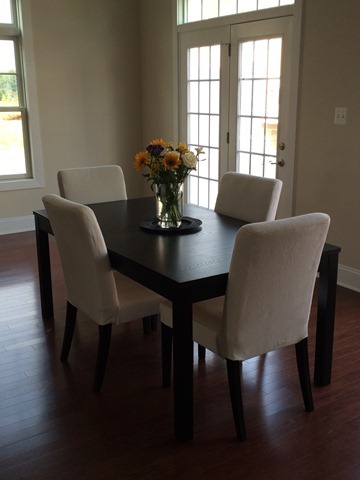 The table is 108” long but there are 2 removable leaves which drop it down to 60”. We can resell it or reuse it as a desk or whatnot. I’m thrilled with this purchase! It is not normal to be as excited about these appliances as I am…but I’ve never claimed to be normal. Jerry and I purchased these 2 beauties at HH Gregg over the 4th of July during The Biggest Sale of the Year. 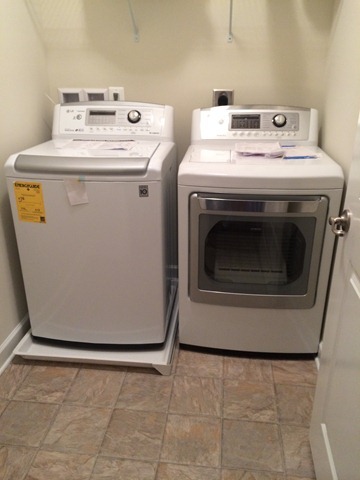 We got a great deal on the washer and the dryer was an “out of the box” model that was reduced by almost 50%. We got the 4.7 CU. FT. Ultra Large High Efficiency To[ Load Washer w/ Waveforce…and the capacity this thing is crazy huge. It’s super quiet and although I’ve only done a few loads, it’s a rockstar! The dryer is the 7.3 CU. FT. Ultra Large Capacity Steamdryer and it’s been great thus far as well. 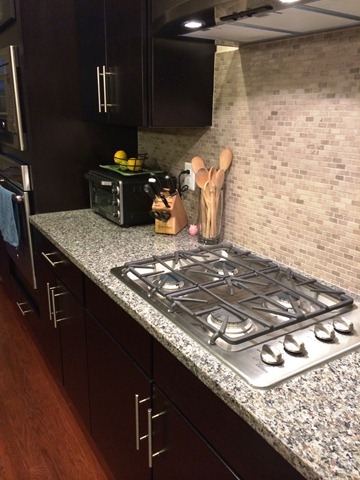 I have a full post in the works all on appliances! Try to contain your excitement. Jerry has very strong opinions on window treatments. He knows what he likes but more importantly, he knows what he doesn’t like. 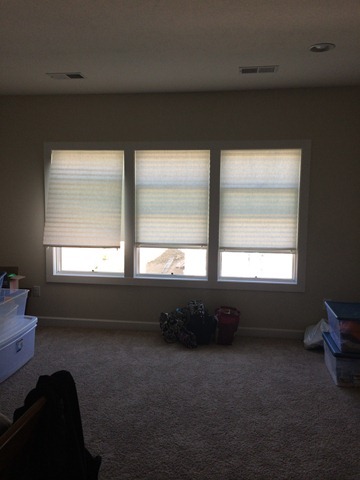 And because holygeez window treatments are expensive…we came up with a nice, cheap interim solution (we’re big on interim solutions in this house!). Paper shades! We bought these ones from Home Depot and while Jerry was out of town on business last week, my Dad came over to ensure I didn’t muck up the installation. These are pretty foolproof but If there is a way to screw it up, I’ll find it. They attach to the top of the window frame like a super stick post it and then you can clip up the length to your desired level. There was some cutting involved (again, better left to my Dad than me) but they were pretty simple! And now my neighbors are spared the free show. The most adorable little consignment store opened in Wexford this summer. I can’t remember the name of it to save my life but it’s by the Aldi on Rt. 19. Anyway, I picked up a few things over the last few months. And this little gem is one of them. Jerry rolled his eyes when I brought it home. “WHAT are you going to do with that thing?” In his defense, it’s pretty huge. And heavy. But I have a thing for metal and fleur de lis so I bought it. 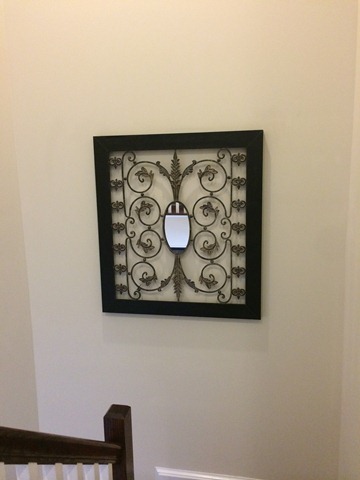 And it’s PERFECT on the wall in our stairwell. So that’s that for this Friday. More house updates to trickle in over the next week or so!! This was a nice relaxing, low key weekend. The calm before the storm that is coming for the rest of the month. I did a lot of cooking and not much else. 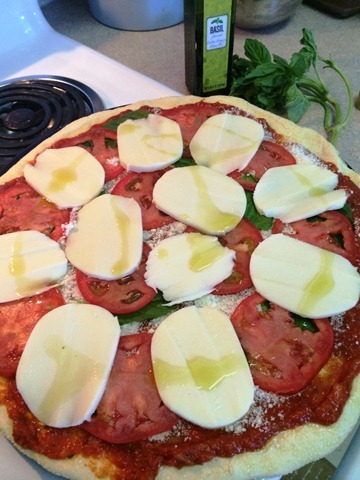 Margarita pizza with my patio grown basil, farmer’s market tomatoes and trader joe’s crust. Very yum. 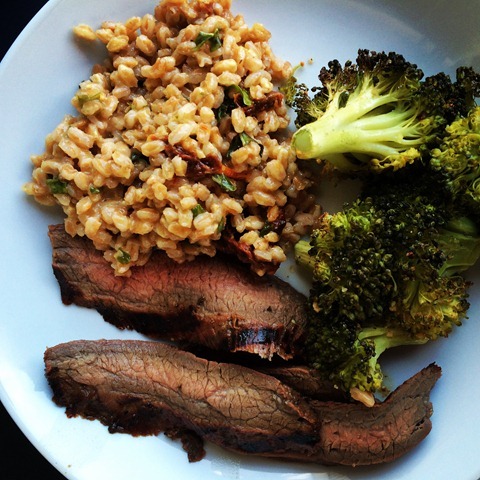 Shenot farm broccoli, Sutton Farm flank steak and sundried tomato & Asiago farro. I am loving all of this local food! We need to talk about this chicken. Chicken is probably the #1 protein Jerry and I consume. We usually grill it but sometimes bake or stir-fry it. 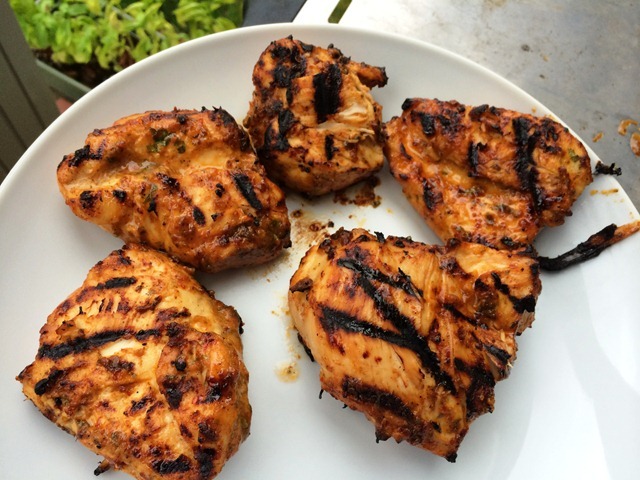 And while it’s very versatile, I get sick of eating the same grilled chicken every week. I made these honey chipotle chicken bowls when we were still living on Shelley Street. I was blown away by the flavor. But as amazingly delicious as they were, I kinda forgot about it. Until this week when I realized I had a 1/2 eaten can of chipotle chilies hanging out in my fridge. I didn’t want to pitch them and remembered this chicken. 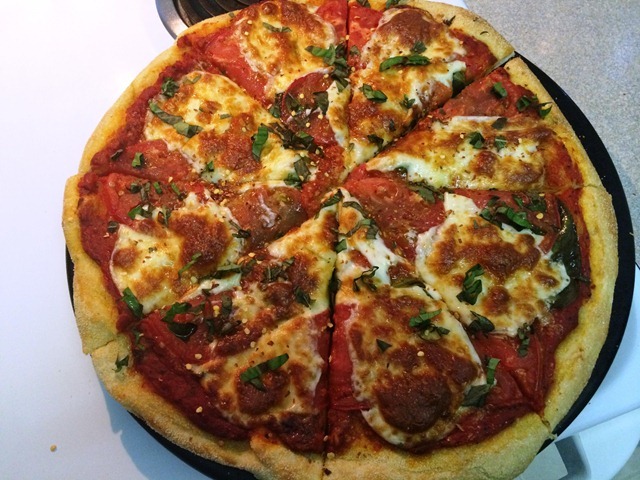 So I bought all the stuff and whipped it up Thursday night. The ingredient list for the marinade is pretty long. Especially if you’re like me and your chicken marinade typically consists of a bottle of Italian dressing. But if you make it in the food processer or blender, it comes together pretty quickly. I doubled the recipe and marinated the chicken for 2 days in the fridge. Reserve some of the marinade to use as extra bbq sauce for dipping. Jerry proclaimed this is the best grilled chicken I’ve ever made. He is absolutely correct. 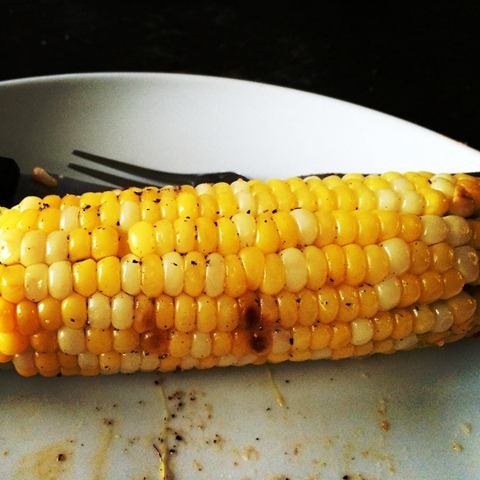 This is the infamous Shenot’s sweet corn and it is heaven on a plate! Oh and we’re buying a house tomorrow. No big deal.